Continuity mistake: The rabbits have a close encounter with some rats in a shed on the cemetery. A spade falls over. In the next shot the spade lays in a wheelbarrow. Plot hole: Perhaps the biggest plot hole in the movie is centered about the reappearance of the Owsla officer Holly. 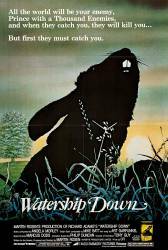 Even if the warren was destroyed right after Hazel's band had departed, Holly would not have caught up with them right before the new warren at Watership Down - even with the delay at Cowslip's warren - with the additional detour in Efrafa, considering that acquiring the amount of information he got from its organization would take more than just one or two days. In addition, Richard Adam's novel, on which this movie is based, features the location of Efrafa some distance away from the down, nowhere between it and the Sandlefort warren (Hazel's and Fiver's home). In fact, Holly went to Efrafa (along with a missionary group of Hazel's band) some time after they had settled down in the new warren. Blackberry: Men have always hated us. Holly: No. They just destroyed the warren because we were in their way. Fiver: They'll never rest until they've spoiled the earth. The term "Prince with a Thousand Enemies" used in the prelude is a direct translation of the rabbit folk hero El-Ahrairah's name.